There is a form of regulation at play on big capital which has nothing to do with Prime Ministers, Premiers, Ministers, Parliaments or the courts. It is a more powerful form of regulation than all these figures and bodies combined. Massive capital investment in Australia is being stymied for the simplest of reasons – the failure of some companies and governments – at all levels – to place enough trust in the general community to consider issues logically and understand the trade-offs. The more this happens the less trust the people have in the systems themselves. Add this to headlines fed by ICAC and other scandals, and we are finding ourselves in a spiralling crisis of confidence in the way our democracy – and ultimately our economy – is operating. The figures are compelling. In its December 2013 Report, the Scanlon Foundation showed just 27% of people had trust in our federal parliamentarians “to do the right thing for the Australian people” – a drop from 48% in 2009. This same report also reveals that community concerns about the “quality of government/politicians” ranks second after “economy/unemployment/poverty” as the most serious problem confronting Australia as a nation in the most recent survey in 2013 – ahead of other concerns including asylum seekers, social issues, environmental problems, health and education. This lack of trust is allowing people power to regulate some of the big infrastructure decisions we need to make. For instance, according to an independent analysis, proposed reforms to the land-use planning system had the potential to boost the economy here in New South Wales by $2-3 billion a year, by speeding up development decisions – including on infrastructure projects – and supporting the construction of additional housing and employment premises. One of the proposed reforms covered big infrastructure projects. Under this reform, once a project had been declared priority public infrastructure, further planning approval was not required for the project. The fact that a Minister had decided the project – whether it be a road, rail line or pipeline – was a priority meant that it was automatically approved and the next development assessment steps would simply look at identifying and avoiding impacts. Yet the proposals were the subject of opposition from a coalition of what ended up being 460 community groups, who felt the reforms would cut them out of the consultation process when it came to critical construction decisions. Single-handedly, this group was able to oppose these reforms to an extent that they failed to pass the NSW Parliament last year. Then there is the example of the coal seam gas industry. Coal seam gas supply – as a potentially important part of our energy infrastructure – has struggled to get a foothold in this State. Approximately 95 per cent of this State’s gas needs are bought in from South Australia, Queensland and Victoria. In Queensland, more than 27,000 people were working in the state’s gas industry last year. In comparison, NSW’s CSG industry had just 332 positions. There are some very good examples of consultation undertaken by gas companies and some not so good examples. On the whole, the industry has struggled to connect and engage with the State’s population, who are wary of its real or imagined environmental risk. Even applications for wells to explore for coal seam gas – as distinct to wells seeking to start production – are greeted with protests involving many hundreds of people. The money is there to invest in coal seam gas. 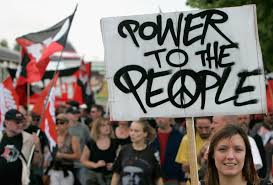 However, big capital is being constrained by people power. Consultation should not just be a late add-on to investment decisions. It should be part of the investment decision. This is an aspect of doing business in Australia that is often not understood by foreign investors. There should be no fear on the part of these investors that people power will destroy their project or indeed the Australian economy. In fact people power can provide reasonable, logical and economically positive outcomes, if harnessed using methodologies which can be trusted. For example, the newDemocracy foundation argues that trusted outcomes are received when a diverse and representative group of citizens – randomly selected – deliberate together. This is in effect, a jury approach. An approach which re-establishes trust in the system. Too often leaders assume that so called ‘ordinary people’ are unable to make rational decisions on complex issues or are only driven by self-interest. They are too readily influenced by what they hear in the mainstream media which is based on covering the most interesting and often most abrasive, noisy voices. This isn’t the case. For instance, the NSW Public Accounts Committee in 2012 established two groups of 26 randomly-selected citizens in Tamworth and Sydney to examine the energy supply future of NSW. These groups willingly invested over 40 hours of their time, over five Saturdays across three months. Even though energy policy is a complex, emotive and advocate-riven area, both groups delivered unanimous recommendations. What sort of recommendations are we talking about? The findings included that the government should legislate around flexible pricing and initiate public discussion around nuclear technologies. Interestingly, neither of the juries supported CSG – arguing its environmental risk was too great. Maybe the battle has been lost here. But many of the other recommendations have the potential for major economic and energy supply benefits. This jury approach is based around random selection, space for deliberation in a non-combative environment and an agreed authority for the recommendations of the jury before they begin deliberating. It is a very 21st century response to the issue of trust. Similarly, there are other consultation tools which address the modern environment we live and work in. For instance, the NSW Government this week allocated some $30 million over two years to roll out electronic planning tools, which is expected to include people being able to visualise in a 3D model the planning changes in their area. The fact of the matter is simply having support from a government for your project – or a lot of money available to do it – is not enough. Big capital needs to think about people power and how to harness it – not just manage its consequences. Do Sydneysiders act like noisy galahs? ← Should we create a ‘Capital City Super Region’?